After receiving about a foot of snow last week, we had a warmer weekend (warmer meaning it was in the 30s) which resulted in some nice ice formations. 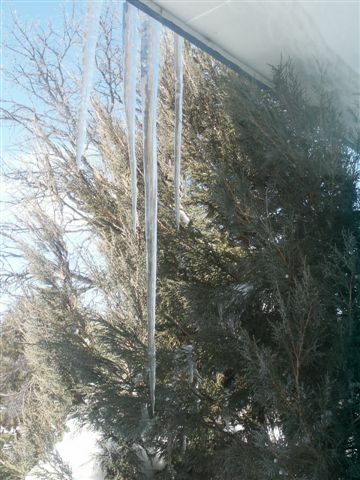 The first picture shows some icicles in one of our trees. 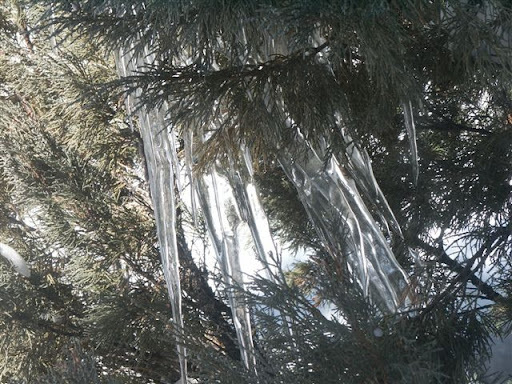 The picture to the right shows how long some of our icicles have gotten. When Jenn was about Bryce’s age (7), she tried to break an icicle off of the roof with an empty, plastic pop bottle. She did succeed in breaking down the icicle, unfortunately she also succeeded in breaking the window. Oops! Next Next post: Like Mother, like daughters?